Brrr, it's cold outside. When there's a chill in the air and you're supposed to be running 26.2 miles, it's no longer a matter of how to stay cool on the course but how to prevent those muscles from freezing or the entire body from chilling. It may seem like a hotter race would be dealer's choice, but as an article in Runner's World pointed out this summer, our bodies perform better when it's cooler. Maybe not at freezing temperatures--the information presented uses 50 degrees as ideal--but we can expect times to slow as the mercury rises. 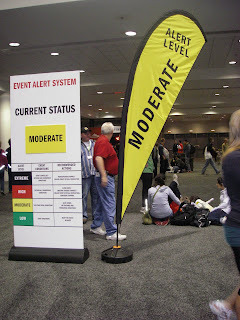 Enough about mercury rising though, as most of the fall marathons are having uncharacteristic lows come race day. Chicago? 33 degrees at the start, warming to 36. Detroit? 28 degrees at the start, rising to roughly 41 by 10 a.m. Twin Cities? 46 at the start and warming to 50. And don't forget the snow that's already made appearances in Colorado, Minnesota, Massachusetts and more. But with this cold temps the question becomes, what do I wear on race day? You need suggestions and we have answers. Arm warmers. 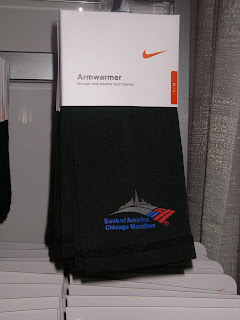 All the rage these days, retailers from Nike to Sugoi and Asics to lululemon have these sleeves on the shelves. Affordable, adjustable and available in various thicknesses for degrees of warmth, you can't go wrong with these on race day. Slip them on as an added layer when you get dressed in the morning and peel them down around your wrists when you warm up--forget fumbling with pulling a shirt over your head and tying it around your waist. Plus even the elite runners--Kara Goucher donned them at the Boston Marathon and Ryan Hall swears by his pair, promising to bring them when he runs New York in a few weeks--wear them during cold races so there has to be some merit, and cool factor. Hat. You probably learned long ago that heat escapes through your head, so wearing a hat would be the obvious choice to keep you warm on a chilly day. Only problem is that after a while it can also make you hot, trapping in all that extra heat. Still a hat is easy to stuff into a pocket or your waistband, and easily replaceable without breaking the bank if you lose it along the route. Headband. Is the hat keeping you too warm? Know that you're an overheater but get cold ears? Keep the head cool but the ears warm with a headband. Also good at concealing headphones, but luckily we don't have to worry about that as much anymore since the USATF raised the headphones ban and most races have welcomed them back into races. Gloves. The extremities are the first body parts to get chilled. And handling all of that cold water and Gatorade/Powerade/Cytomax/etc. at the aid stations can make them even worse. 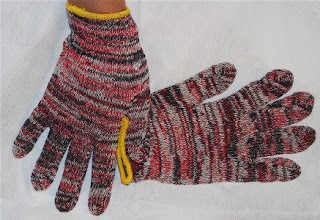 You don't need to go all-out and get fancy gloves for the occasion--the $1 or so variety from the drugstore (the woolly kind) hold up to the elements and are easily replaceable if you drop one on the road. The only downfall is they make it more difficult to adjust an iPod's volume and dig for Sport Beans in a pouch. But warm digits are better than numb ones. Sweats. I'm all about staying warm before the gun goes off, but I hate parting with a favorite sweatshirt or having to track down a replacement for the sweatpants I just left on the side of the road. While it takes a little planning--or spare time come race week or weekend, depending on how close to race day the weather takes a chilling turn--a visit to Goodwill or the Salvation Army for a discounted pair of sweats, or even a blanket, can provide cheap comfort at the start. And you're even doing a little recycling with whatever you leave in the start corrals and along Columbus Drive--the clothing is donated after it's swept up. Or a runner staying at my parents' hotel claimed he purchased his sweats for $4 at Walgreens around the corner. That's not a bad deal either. Space blanket. Because I hate parting with my clothing and I never make it to the Salvation Army for a pre-race outfit, I've devised a different method that works for me. I come armed with a space blanket that I've acquired from a previous race. My mom thinks I'm nuts for saving them, but I only have one in my stash--and it folds up flat and tiny in the drawer--and I bring it out in the cold weather. It's wrapped tightly around my legs until I shed my fleeces and then I wrap it over my shoulders to cover my arms too. The only problem is tossing it to the side when I'm ready to leave it at the start line: this year I tried to toss it to the curb but the blanket flew up in the air and glided onto another runner's head. While it was great for this race, I think my mom tossed the one I acquired at the finish line, foiling my plan for the next chilly day.